We love seeing families here at Columbia Healthy Smiles, and that includes your littlest members! Visiting the dentist for the first time can be a scary experience for children, which is why Dr. Philip Batson and the rest of our team work hard to create an environment that’s as friendly, fun, and comfortable as possible. Better yet, our gentle children's dentistry can help your son or daughter get started on the path towards lifelong oral health earlier than ever. The development of your child’s smile is very important, which is why we’d love to be there for them every step of the way. Our team will always customize their care depending on their age and unique personality so that it’s never too much, too soon. Plus, by catching potential problems early on in their growth, any needed treatment can be much simpler and less invasive. Family dentist Dr. Batson also provides preventive measures beyond regular check-ups and cleanings that can strengthen your son or daughter’s oral health and help protect them from damage. Dental sealants can be painted onto the chewing surfaces of certain teeth, minimizing the risk of food particles burrowing there as your little one learns to brush and floss properly. 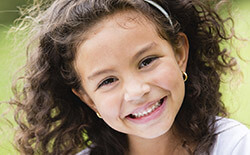 Fluoride treatment can also help lessen the risk of cavities. We can’t wait to meet your whole family here at Columbia Healthy Smiles!